Alchemy Architects was founded by Geoffrey Warner and offers traditional architecture design services for residential and commercial clients and prefabricated home design and manufacturing based on the weeHouse modular home system. Alchemy’s first weeHouse, a prefabricated single room cabin, was built in 2003. Since that original weeHouse, Alchemy has expanded the weeHouse prefabricated home system to include a variety of standard home designs utilizing one or multiple prefabricated module building blocks (standard home models are designed from 1X, 2X, 3X, or 4X builds utilitzing 1, 2, 3 or 4 weeHouse modules). weeHouse designs can also be completely custom created for the unique needs of individual clients. The weeHouse system has been used to build homes, cabins, offices, studios and multi-family developments throughout the United States. Over 40 weeHouse, prefabricated projects have been completed to date. Alchemy takes pride in their direct, hands-on approach to design and relationship with clients during the design and build process. Their creative focus is modern but is influenced by history, art and practical, solution-based thinking. Alchemy also aims to be responsible, offering energy-saving designs, low-waste building techniques and green energy options for homes. Homes are offered as standard models, hybrid semi-custom homes or completely customized. Homes are designed and built around the modular building blocks of Alchemy’s weeHouse modules, using 1 or more modules in standard or custom designs. WeeHouse modules are factory built, truck delivered and assembled on site. weeHouse homes are constructed to meets standards for 130 mph wind zones, zone 4 seismic regions and snow roof ratings of 60 psf and are suitable for a wide variety of sites and climates. Standard packages include a finished home complete with doors, windows, insulation, plumbing and fixtures, electrical wiring and lighting, cabinetry, counter tops, appliances and forced air heating and air conditioning. Not included are transportation of the home, crane and setting costs, foundation and site work, utility hookups and connection, and locally completed button-up work. 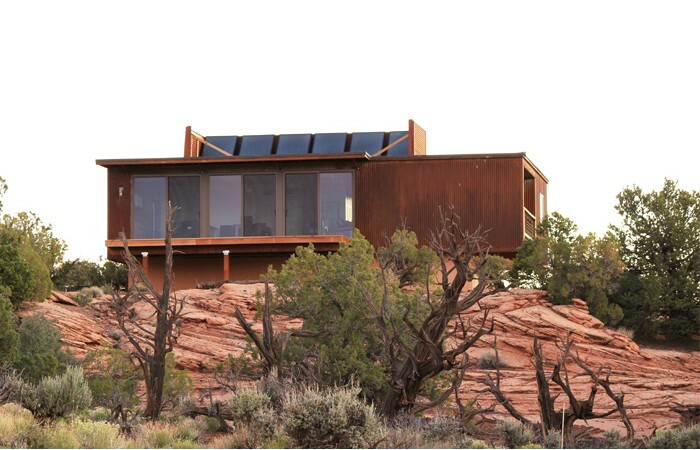 The Mafa WeeHouse, A Compact Desert Retreat | ALCHEMY ARCHITECTS. 11-09-13. http://smallhousebliss.com/. Alchemy Architect’s weeHouse: Beautiful Tiny Homes. Susan Melgren. 01/02-12. NaturalHomeAndGarden.com. New Green weeHOuse Set in New York. Preston. 03-12-10. Jetson Green. The weeHouse comes to Linden Hills. Roseanne Pereira. Minnesota Public Radio.